Meal-making has been sketchy around here the past year or so. I don’t know what’s wrong, but I seem to be unable to put hot food together on any kind of regular basis. 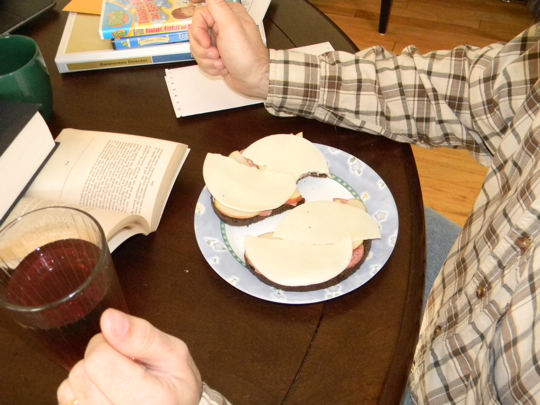 Something that has saved dinner the past few weeks is having a loaf of pumpernickel bread, honeycrisp apples, summer sausage and cheese on hand. I eat a slice of bread with butter and cheese, then have slices of sausage and apple as ‘side dishes’. 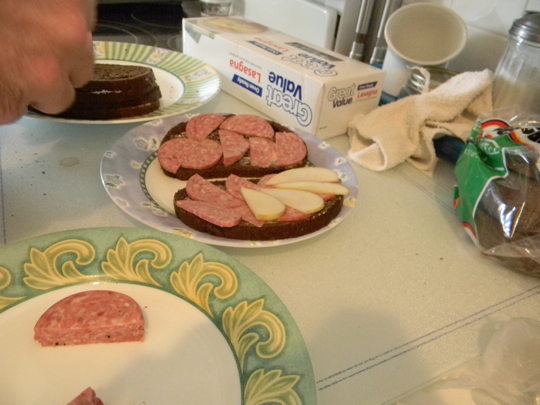 Lloyd creates an abomination: an open-face cheese/sausage/apple sandwich. Crazy. I refuse to try it. Here is the final product with way too much flash. Did you notice the wafer-thin apple slices? 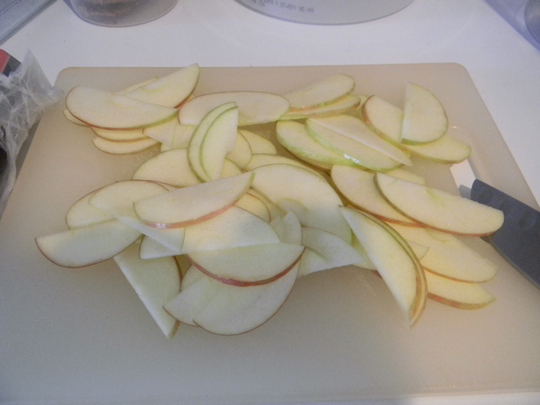 Oh, how I love to cut apples. I know I’ve gone on about this before, but I consider it my super power. 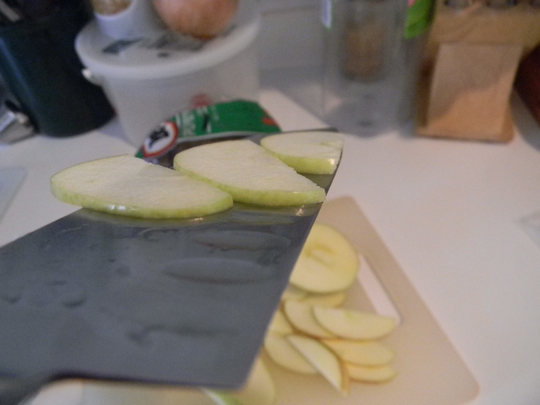 As I was slicing, I told Lloyd that he should call me ‘Mandy’, because I’m like a mandoline. “You’re an instrument?” he asked. I scoffed and proceeded to tell him what a slicing mandoline is, but he cut me off by singing ‘Mandy’ to the tune of ‘Brandy‘ really, really, really loudly. Grrrrrrr. Cretin. Look at these slices. I must be a robot. 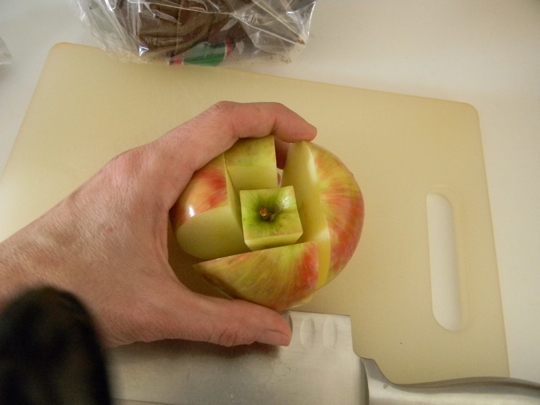 I have a new way to cut apples up. I used to quarter them, diagonally cut the core, then slice, but this is faster – slice off a side, then another, then another, then the last. The pieces are already set up for perfect parallel piecing. Woo-hoo!! The slicing! The slicing! …. I think I might have a problem…..
(By the way – Dad, your box of Fujis came yesterday. I’m going to look at them with the kids today. If they’re lucky, I’ll slice them some. I recently discovered the side-slice technique also. Love it! 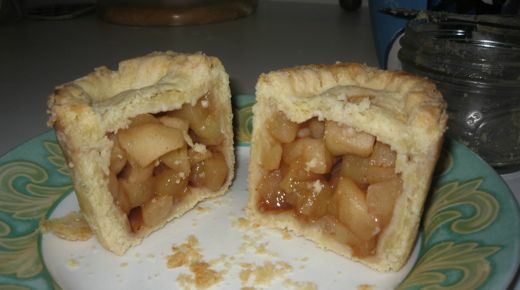 I have a slight modification: after the first slice turn the apple 180 degrees for another whole slice, then the two smaller sides. I appreciate the symmetry. Mandy, that is better than a mandolin. Fewer dishes, less storage space, and fewer scars. I don’t know that “Brandy” song at all. I can’t remember even hearing it. And what does it mean that you’re going to “look at” a box of apples with your kids? I’m imagining everyone sitting around the box of apples and staring at it. Gretchen -- amen! We are slice soul sisters. I wish you could get a job at my food store in the Deli. They never slice my ham thin enough. I don’t want it chipped, but sliced very, very thin. They just don’t get it. Deli slicer is my true calling! 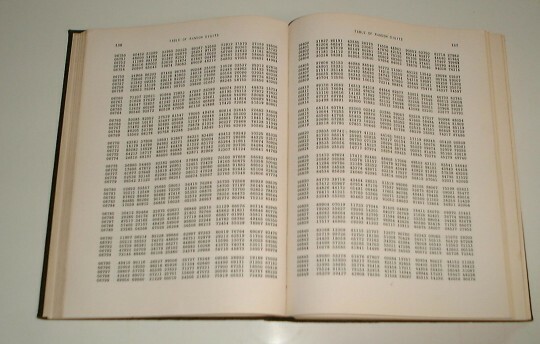 Where is the nearest deli? ?